What is drawboring??? Read about it here. Basically, you have an offset peg that is driven through the mortise and the tenon. This forms a tight mechanical bond between the two that is constantly being pulled tight by the offset peg. This is the first time I have used this technique for joining mortise and tenons. I followed the steps outlined in the link above and in Schwarz’s ‘Workbenches: From Design & Theory to Construction & Use’ that is available at Lost Art Press. The technique is really quite easy, and something I will use as often as I can. One of the great things about this technique is how the drawbore closes up the joint. I had a couple of tenons that were not so snug in their mortises. They probably would have been okay with just glue, however I am certain now they will never come apart. From what I understand about drawboring, you don’t need to use glue at all in the joint because the offset peg mechanically bonds the mortise and tenon. I wasn’t quite sure how everything would turn out (as this was my first attempt), so I spread some glue on the joint as well. I ended up using 3/8″ oak dowel stock for my pegs. 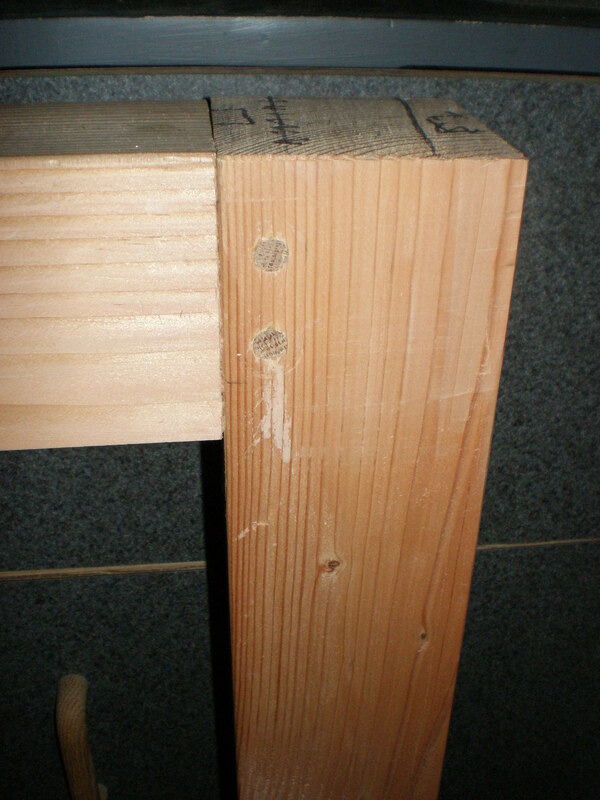 I drilled a 3/8″ hole about a 1/2″ in from the edge of the mortise. 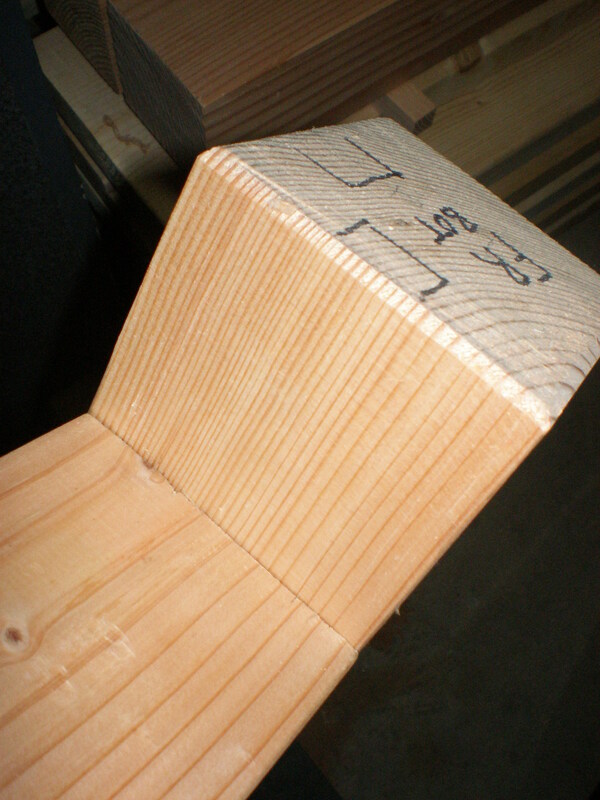 I marked the offset 1/8″ toward the shoulder of the tenon. I used alignment pins that I picked up from Sears for about $6-$7. I was debating purchasing drawboring pins from Lie Nielsen, but once I read Schwarz’s article in the link above about drawboring, I knew that was the way to go. 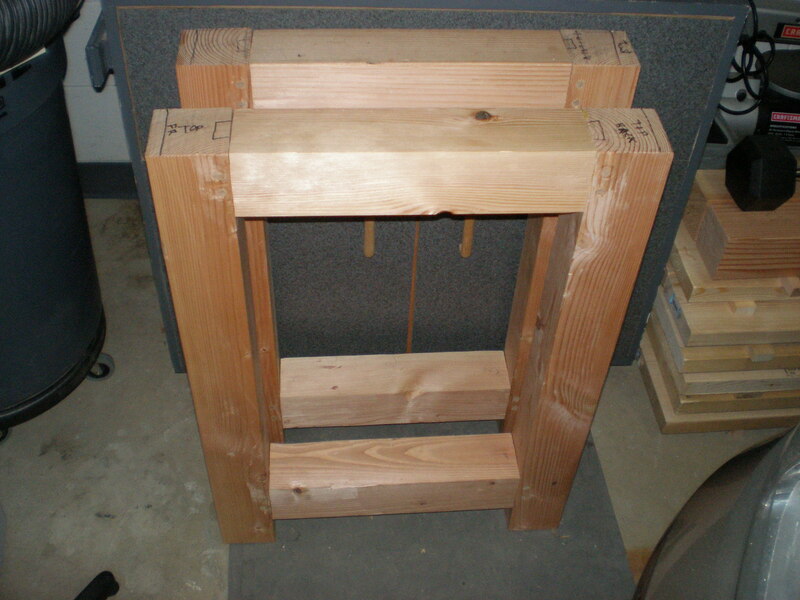 The alignment pins worked great…helped me to draw the joint together for test fitting and final assembly. Everything went together very well, except when I came to the very last peg. Usually you can tell when the peg has bottomed out in the hole by the change in sound when driving the peg home. I must not have been paying attention, because I missed it. I just kept hammering with gusto. Then I heard that awful sound of wood cracking…I had split the wood out the back side by driving the peg too deep. I assessed the damage and determined a way to fix it. Luckily most of the dama ge will be covered by the lower stretcher that connects the two side assemblies. I was more concerned with the damage I had done to the corner of the leg. 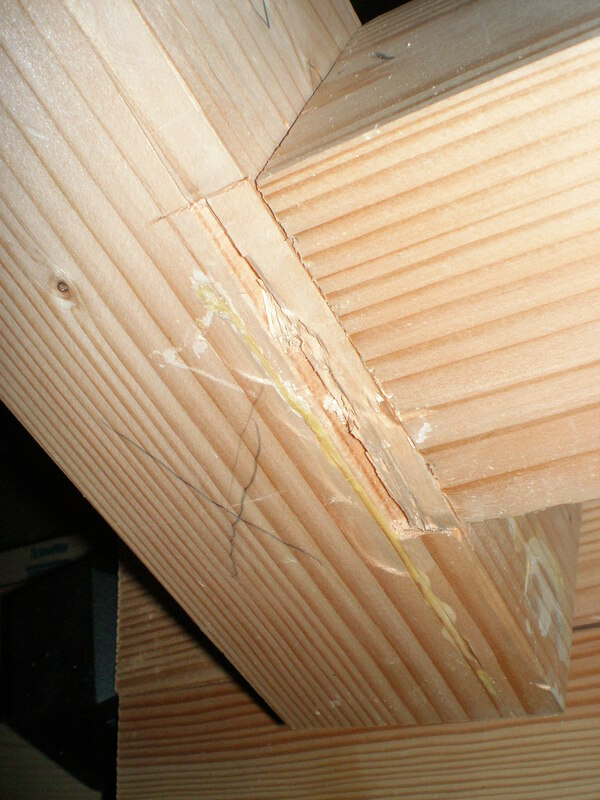 I ended up removing the damaged section of that corner…cleaned up the damage…then glued it back in place. The repair looks like it will be just fine, and the leg was not compromised. It was a good lesson learned for future drawboring…glad it happened on my workbench where I don’t really care too much about appearance. I finished up the legs by adding a chamfe around the bottom of all the legs to prevent them from splitting should the bench be moved around. Next up: I have to plane a couple of reference faces on the two lower stretchers that connect the two side assemblies. Then I will cut the tenons and chisel out the mortises as I did for the side assemblies…and eventually drawbore them too. At that point, it might start to look like a bench. 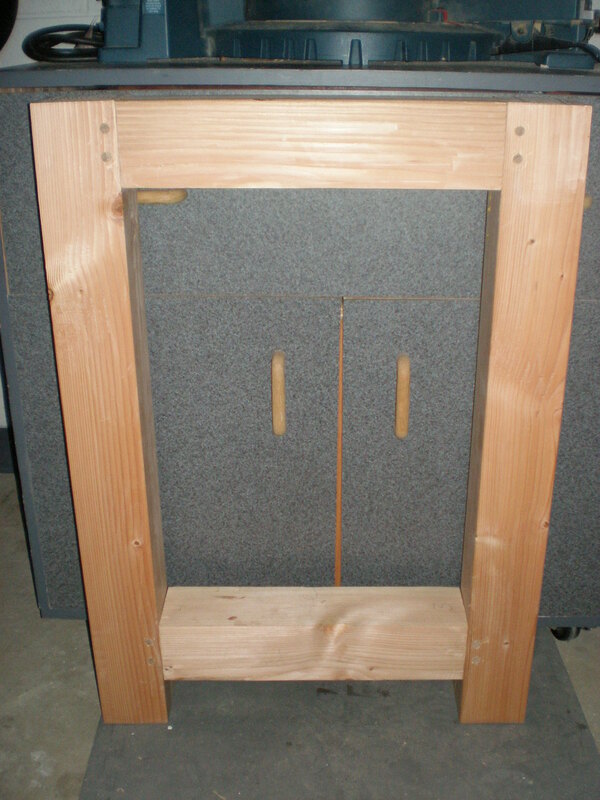 This entry was posted in hand tools, VCF, woodworking, workbench and tagged hand tools, woodworking, workbench by villagecustomfurniture. Bookmark the permalink.